You are talking about memories. 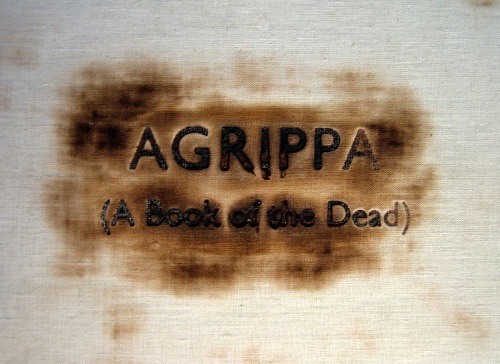 William Gibson’s most controversial work to date, “Agrippa (A Book of the Dead)“, was supposed to exist only in the memories of those who experienced it. The work would not be physically accessible after its initial encounter with a reader. I mean, you cannot read it twice. And this needs a little bit of explaining. This work was originally released in two forms; a floppy disk and a physical book. On the floppy disk, there is an executable program, which, upon execution, scrolls the poetry titled “Agrippa” on the screen, stanza by stanza. The catch is, you can read it only once. The text data is designed to vanish, or more precisely speaking, each stanza is encrypted after it scrolls all the way up on the screen. Even if you click the program again, it will not work as it did. It’s gone. The text is gone forever. Another form, a physical book, also contains the same poetry, but the text is printed on photosensitive paper. By opening the book, the pages are exposed to light, so while you are reading, the text just fades away. Somehow, this concept scares us. At least it scares me. We come to rely on the notion that we can revisit whatever we encounter at a later time, so that we can re-experience the experience. This xerography of experience was mostly limited to that of text just over a century ago. The desire to revisit the reading experience of a certain text materialized in the form of books. Since 19th century, human invented many other xerographic contraption to preserve our experience, – photographs, phonographs, magnetic tapes, films, compact discs, DVDs and hard disks – today, we are all surrounded by platters, cassettes, boxes and cables so that we can reproduce sound or image, whatever we want, whenever we please. We no longer cherish fading images of a film once we saw in the darkness of a decaying theater. A DVD will give you a clean image of THE SHINING, ON THE WATERFRONT or POLICE ACADEMY 3: BACK IN TRAINGING for that matter, whenever you feel like it. Listening to the quartet in the opera LA BOHÈME used to be one-time experience of a lifetime. But today, you can listen to it endlessly on iPod. You don’t have to remember lines in Raymond Chandler’s THE LONG GOODBYE or an article in New York Times, because Google will fetch it for you. We have forgotten how to remember. …. for this discovery of yours will create forgetfulness in the learners’ souls, because they will not use their memories; they will trust to the external written characters and not remember of themselves. Memory is a requiem for the dead neurons. Since modern men, that is, we (or some of us), were nervous about this refusal of xerographic contraption by “Agrippa”, or about mere presence of such an idea, they did the obvious thing; a group of researchers at University of California, Santa Barbara, created a copy of the original “Agrippa” floppy disk, then deactivated its self-destructive function. Now it can be played over and over again. Here, the original concept of Gibson was completely defeated, and once-legendary “transmission” events – performed in Greenwich Village two decades ago – can be recreated on PC anytime, through YouTube, or from a downloaded file. A great idea. But, wait. Think about it. You are going to play the downloaded file knowing you can replay it at a later time. You can pause it while you answer the phone, even. Is it going to be the same experience as the one you would have experienced in The Kitchen, Greenwich Village, New York, on December 9, 1992? I imagine this: With the original, I know I see it only once. My sensory functions are tuned to the events I am about to experience. All the attentions are there, and memory function is geared up to record the event into my neuron system. But we know the nature of our miserable memory system. Fragile, liquid, slippery, shapeless, unreliable. We are cursed by it, we are doomed by it, and we are blessed by it. But as with this immortal copy produced by the scientists and engineers at UCSB, I know I can see it again in the future. I don’t have to be attentive all the time. Lack of attention? Yes, maybe. What’s more, is that I don’t rely on my own memory system as much as I could. I rely on the external memory, the memory which is perfect and never fails me. Socrates would be dismayed to learn we are a bunch of lazy slobs who cannot even remember several stanzas in one poetry. Why do we need external memories anyway? Why do we feel the need to re-experience the experience? Why are we not satisfied with our own fading memory? Not only we feel the urge to re-watch GODFATHER for one-hundred-twenty-fourth time, we need to have it in our collection of polycarbonate platters. As a DVD. As a Blu-Ray. As a Coppola Restoration Blu-Ray. We just have to listen to Janis Joplin over and over on a vinyl, on a cassette, on a CD, on an iPod. If anyone from 5th century B.C. Greece saw us, he would be convinced we are all suffering from some kind of mania, obsessed with externalizing memories. Our memories will fade eventually, so are we. Maybe consciously or not, we are confronted with our own mortality. Maybe we are trying to beat the death. Maybe we are trying to escape from the grim reaper by buying platters of platters of DVDs. And another thing. Why are we so obsessed with “original” or “authenticity”? The complete reproduction of the original release, first edition, director’s cut, restored version, and so on. No scratch. Perfect color balance. Perfect sound. But think about it. When Led Zeppelin’s second album came out, how many of the vinyl owners at the time were able to experience the sound of today’s remastered CD? None. During the original theatrical release of THE RED SHOES, how many movie theaters were conscious enough to care for handling the print, adjusting the sound, or preparing for the best presentation? I would say not many. In 2009, the film was restored to full splendor, with help of Martin Scorsese, who said it looked better than it ever did. Yes, the restored version looked better than the original it was supposed to be restoring. It sounds like this “perfect original” is the product of our imagination. There is another twist in the resurrection of William Gibson’s “Agrippa”. It is a tale of strange revenge by the original idea. Since Mac had gone several revisions of its OS and numerous changes in the system, it was simply impossible to emulate the environment of 1992 on the modern-day system. This lead to the failure of complete “recreation” of the “Agrippa” file execution. Even after several attempts to emulate the perfect original, there is still a few glitches in an immortal copy. Technologies today is too advanced to revisit the past only 20 years ago.